This wonderful and healthy salad is a take-off of the classic Waldorf salad. My inspiration came from Mark Peel in Food and Wine, November 2009. I modified it to the tastes of my family and what I had in my kitchen. It is incredibly easy to make and gets it spiciness from the arugula, radish and cumin! In a small bowl, combine shallot, lemon zest, lemon juice, canola oil and cumin. Whisk thoroughly. Add salt and pepper to taste and whisk well. Preheat oven to 350 degrees and toast walnuts for about 8 minutes, until golden and break into pieces. 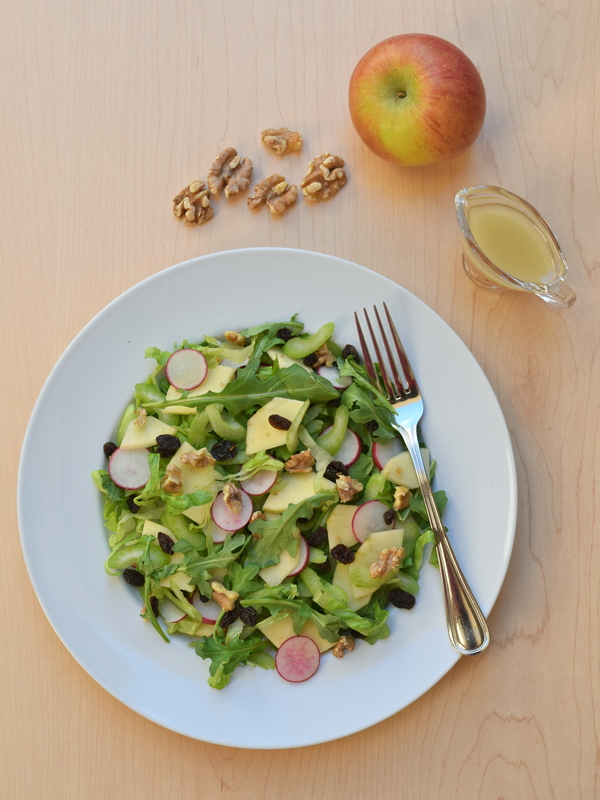 In a large salad bowl, add romaine, arugula, celery, radish, raisins, apples and walnuts. Toss with dressing and serve immediately. Serves 4.